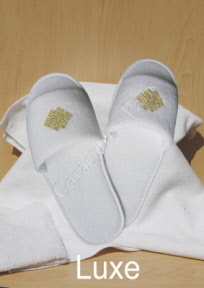 Welcome your valued guests with these specially-made slippers, which will enhance your image and reputation with a touch of luxury, while still keeping costs down. These high-quality slippers will proudly display your company’s logo far and wide, paying for themselves in name recognition. This very popular deluxe slipper comes in white and is made of a soft, sponge-like material that’s comfortable and absorbent. It can be made in any colour and different material. The non-slip soles make it ideal for the bathroom, the locker room and by the pool. The slipper is open-toe or closed toe for maximum comfort.